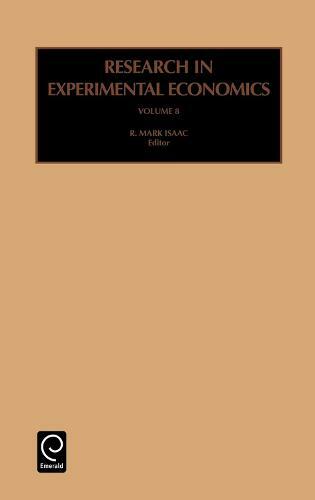 Volume 8 of "Research in Experimental Economics" provides a forum for papers incorporating laboratory experimental economics. These specifically include interdisciplinary papers, papers that report experimental design innovations and papers that report detailed data. The paper by Isaac, Walker and Williams is an example. It discusses the design of instructional experiments in such areas as monopoly, asset trading double auctions, and public goods. The paper also examines practical issues of using laboratory experiments as a teaching tool. Four papers report on public goods research. Krishnamurthy, motivated by research questions in Marketing, examines the role of non-binding, face-to-face communication in public goods environments with and without provision points. Chewning, Coller, and Laury incorporate a natural modification of previous provision-point environments, namely, multiple provision points in which additional amounts of the public good will be provided at increasing threshold steps. The paper by Packard, Isaac, and Bial extends research on the marginal per capita return effect (broken down between the MPCR affecting own payoff and affecting others). This paper takes that distinction to a boundary in which the public good provides no marginal per capita return to the contributor. The paper by Croson examines, in the light of the literature on team production, the effect in a public goods environment of different levels of feedback on others' contributions. In one treatment, individuals know only the aggregate contributions of others, while in the other treatment they had information on individual decisions. The paper by Kelly extends existing research regarding single sellers by providing for multiproduct monopolists. It is not merely the addition of additional products that distinguishes this paper, but also the fact that monopolists have a bundling decision to make. This volume concludes with two papers that use controlled experiments for testing policy-relevant allocation mechanisms. Elliott, Kruse, Schulze, and Ben-David examine four mechanisms for the rationing of productive inputs that are subject to supply shocks. Electricity markets are one obvious motivation, but certainly not the only one. Ishikida, Ledyard, Olson, and Porter present experimental "testbedding" research on the California RECLAIM emissions permit market.